The Irrigated Rice Research Consortium (IRRC) held a training course on ecologically based rodent management on 27-28 May at Barangay Belwang, Mountain Province, Philippines. The training course was co-organized by the Social Action Development Center (SADC) Vicariate of Bontoc-Lagawe, Mountain Province. Belwang, a remote mountain village in the Cordillera Administrative Region, is currently experiencing serious rodent problems in their rice terraces and fruit orchards. With the help of Rolf Boller, project leader of the Environment and Sustainable Agriculture Program of SADC, and the Office of the Provincial Agriculturist in Mountain Province, the community sought assistance from rodent ecology expert and IRRC coordinator Grant Singleton. The course started with a demonstration on how to set up rat traps in the rice terraces, fruit orchards, and village. The formal training on the second day was attended by 115 farmers, who constructed a cropping calendar and identified rice as their dominant crop. They identified rats as the most important factor limiting their rice production. Individual farmers indicated 10-50% losses in harvest potential of rice because of rats. A lecture was given on the biology of the local rodent population, followed by a detailed decision analysis of the community’s current rat-trapping methods. The participants were introduced to the benefits of synchronous cropping, good hygiene in the fields and houses, community action, and the community trap barrier system. 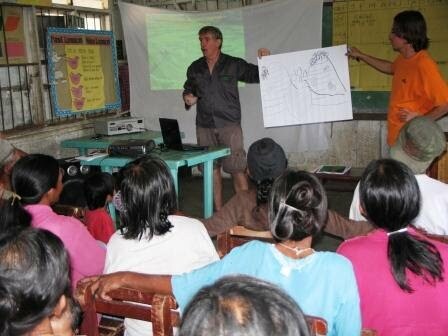 The final part of the formal training included a workshop with 10 key farmers to formulate an action plan. The IRRC team was composed of Dr. Singleton, PhD scholar Nyo Me Htwe, wildlife biologists Harvey Garcia and Vincent Sluydts, and communication officer Rona Rojas.